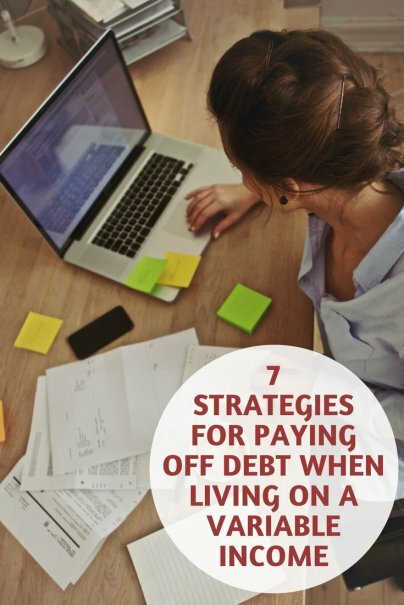 Paying off debt can be a challenge even if you have a steady paycheck. When your income is variable, it's even harder. These strategies can help you take care of your financial obligations even when your salary isn't stable. Take a look at your earning potential and set a baseline. Base it on what you can expect to earn even in a worst-case scenario month. For example, if you're in sales and you earn a base salary plus commission, your baseline is your base salary. If you're a freelancer with several contracted clients and fluctuating income from other projects, your baseline is what you earn from the ongoing contracts. Be very detailed in your baseline budget. Your recurring bills are the starting point; your actual spending is just as important. You need to know, for example, if you spend $100 on books every month, or if your grocery bill is $200 more than you think it is. Once you're aware of all your bills and expenses, look for ways to reduce them. You don't need to reduce them all; keep the expenses that give you the greatest payback in satisfaction and minimize the costs that don't add much to your quality of life. If you're paying off more than one debt, debt consolidation might be key to reducing multiple high-interest payments into one monthly payment. Explore your options to determine if you can lower your debt interest and payments and close that gap. When you have a high-earnings month, send a percentage into a savings account and let it accumulate over time. When needed, you can use it to fill in the gap when your baseline earnings aren't quite enough. Another strategy for closing the baseline gap is to pick up a steady side job. There are many kinds of side hustles and part-time jobs you can consider; it's most helpful, in this case, if you find one that will give you a predictable amount of earnings every month. That way, you can add it to your baseline so that there's no longer a gap between what you'll make and what you need to make. When you get that big commission or finally get paid for the last project, it's tempting to splurge and enjoy the high times. A little splurging is good for morale, but the key to surviving and thriving on a variable income is making the most of the big paydays. You may not be able to add to your savings during the lean times. But when your earnings spike, save a good percentage of it. Put a plan in place before you get the big payday. You might decide, for example, that anything over your baseline gets divided into three categories: 30 percent for savings, 30 percent for debt payments, and 30 percent for expenses that have been on hold. That leaves you 10 percent for splurge money. If you use the plan above, or one similar to it, you'll know that a set percentage of your earnings over baseline go to reducing your debt. It's good practice to pay off the debt with the highest interest rate first, otherwise known as the avalanche method. You can also negotiate with creditors if you have a good chunk of the debt ready to pay. Some creditors will reduce your total amount owed if you're able to pay off most of it in cash, right away. Finally, don't let a variable income keep you from being smart about how you save. While it feels good to have cash at the ready, it's a smarter long-term strategy to put your savings into high-earning investments. Build up a decent emergency fund so you can handle a crisis and close that baseline gap as needed. Put any savings beyond the emergency fund into longer term investments with a higher yield, so you make the most out of your income, variable or not.